February, 2019 Update: Did the groundhog see his shadow? We are not sure, as we are busy working on our web site, now over 5800 items, with more items being added weekly! Please check out all of our Gift Wrap items, including new Jewelers Roll patterns! We have also added Busch Burs, Drill Bits, and other tools of the trade! Welcome!! We welcome Wholesalers, Jewelers, Watchmakers, Students, Craftspeople, Hobbyists, Collectors, & Retailers to our website. We welcome new vendors Alpine from Canada, & Ikohe! Alpine has a nice assortment of both Watch Bands, & Medical Alert products at attractive prices, plus some new Pocket Watches we will be carrying. Ikohe is a long time Tool & Supplies master distributor, we look forward to sourcing many of our regular items from them. Our NEW Crystal Information Booklet is now available! It has been increased from 8 to 12 pages, & is updated with information & descriptions of the crystals we stock, current prices, & related tools & supplies. Do you have your NEW TIMEX 2018 Catalog yet? Look for Acqua & Carriage watches to be combined under a new name, Viewpoint! These are popular with everyone from Jewelers & Watchmakers to Hardware Stores & Drug & Variety stores! Also available are 8 new Peanuts watches, featuring Charlie Brown, Snoopy, Linus, & Lucy! Check them out! Regarding Watch Material--we do not list too much material on this site-- thats by design-- there are thousands & thousands of possible parts-- we would never even make a dent, on what we have inventory on! 90 years in business means we have lots & lots of parts! Please email, or better yet call us with your requests-- we probably have what you need, both vintage, hard to find, & new! Make sure you have a copy of our new 68 page Watchmakers Essentials Booklet, which has been very well received by watchmakers AND jewelers alike! Yes, you can view the PDF online also, or ask for your copy! The "Browse Our Catalogs" section of our Website is no longer functioning. Instead, we've added more catalogs to our Current PDF Ads, Catalogs, & Information Category. Here you will find Tool & Supply Catalogs from Eurotool, & Grobet (New 2015/2016 Edition); These include the 2017/2018 TIMEX catalogs; our 68 page Watchmakers Essential Booklet, 2016; Our own Twin City Supply Quartz Watch Movement Booklet--Revised, February 2014; Our 2009 Express Book-Revised 2012; New 2015 Watch Band Headquarters Catalogs, 9th edition; New 2017/2018 76 page Giftwrap Catalog; Our New updated Crystal Information Booklet; New 2015 Spring Mini Sampler Express Booklet; various Twinco Times, & many updated pdfs & ads for watchmakers, jewelers, & craftspeople. Also, there are price lists for Energizer/Renata/Sony Batteries; L&R solutions, other flyers, all to help keep you up to date! Our address is: 14325 23rd Avenue North, Minneapolis, Minnesota 55447 (we are located in the suburb of Plymouth, but use Minneapolis as the city). We are easy to find, located on the corner of Fernbrook & 23rd Avenue. Showroom is open M-F, from 8-3. Will call orders may be picked up until 4 PM. Most prices you see are our everyday low prices. Some items, such as watches & watchbands, are shown at retail. For stores & authorized customers wishing to purchase at wholesale pricing, you must first be registered, then logged in as a wholesaler & be approved to see & purchase off of the wholesale tab. Please allow us up to 24 hours to set you up for this on the back end. Customers already having a Twin City Supply open account can choose the option, "bill to my existing account" In this case, You would already have an account set up, that might look like this example, for Snyder Repair of Lawrence, Kansas:: SNYLKS. No need to use a credit card-- unless you want to. In some instances, ESPECIALLY International shipping, we may need to contact you after you check out for additional shipping funds. The web site does not properly charge correct shipping for some items. In General, orders under $50.00 will ship by US mail, orders over $50.00 will ship UPS. Priority Mail with tracking can be arranged in house-- not thru the web. Heavy items, under $50.00, may need to be shipped UPS, & in that case, we will contact you. International customers are advised to check with us prior to ordering. We DO NOT Ship liquids, or heavy items overseas. In Great Britain, we have an issue with the "States" Field-- please enter your information in the comments field. Concerning watch material, we do not supply parts to end users for their own watches. Please do not ask us for stems, crowns, crystals, or gaskets for your own personal watch. We want you to work with a jeweler or watchmaker in your area who can order from us & install exactly what you need. We appreciate your patronage and look forward to helping you! Look who's back! After years of lobbying, We are proud to announce that ACQUA IS BACK! Timex listened, & they are back with 7 new styles! NOW IN STOCK! Men's silver expansion band with white dial, quick date feature, 3 year battery, water resistance to 30 Meters. New styles do not have Indiglo. Ask about available Acqua/Carriage/Marathon Displays. Wholesalers, & dealers, make sure you are registered for our wholesale tab to purchase! Men's Black synthetic band, quick date feature, 3 year battery, water resistance to 30 Meters. Men's Brown synthetic band, gold bezel & hands, quick date feature, 3 year battery, water resistance to 30 Meters. Spring 2018: The new Spring 2018 catalogs have arrived! Carriage, Acqua, & Peanuts watches are also included. CL0377 New! GemOro UltraSpa-- Slate--designed for personal home use! 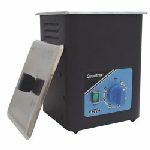 The world’s only personal combination jewelry cleaning system utilizing both an ultrasonic cleaner and steam cleaner in one specially designed appliance for the home or jewelry store. The ingenious UltraSpa is a professional quality machine that provides ultimate cleaning results for sparkling diamonds, gold, silver, platinum jewelry, metal watch bands and more. Totally in a class by itself, the UltraSpa has both powerful ultrasonic cleaning and high-pressure steam cleaning in a single appliance. With a two-stage cleaning process, scrub dirt and grime with intense ultrasonic sound waves and then with the steamer blast away hidden dirt and the remaining residue from all hard to reach areas with amazing results like no other jewelry cleaner period! 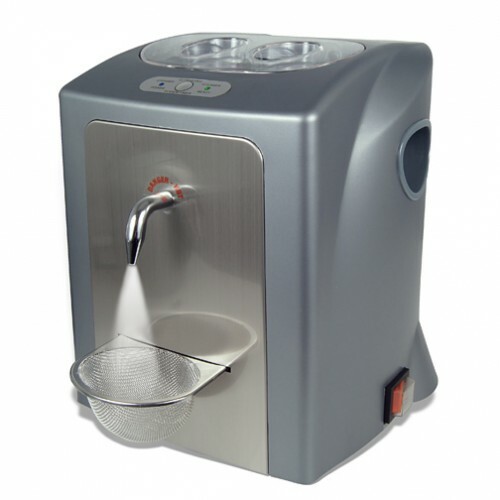 CLQ90 L&R Ultrasonic Cleaning Machine--2 Quart Manufactured in New Jersey, the L&R Q90 is our most popular Ultrasonic cleaning machine! 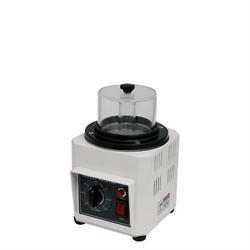 Two Quart size is perfect for shop or counter use. The Versa-Light is a super bright LED light with three settings: High Beam, Low Beam and Flash. The sturdy clip holds the light while the 8-1/2 inch flexible arm allows for easy adjustment. The strong magnetic base stays secure on metal surfaces for hands free work. Use the light zoom function to pinpoint light onto small areas or zoom out for a wider view. Includes 3 AAA batteries. SAVE 5%-- NOW only $321.10! We have a large selection of accessories in stock! This is a really nice set! SC10JS Ohaus Sapphire 10 Carat Scale (Scout ll series) Blowout price! SC10JS Ohaus Sapphire 10 Carat Scale (Scout ll series) Blowout Priced! as of January, 2017, we have 5 left! Brand New, in boxes! 50% off! 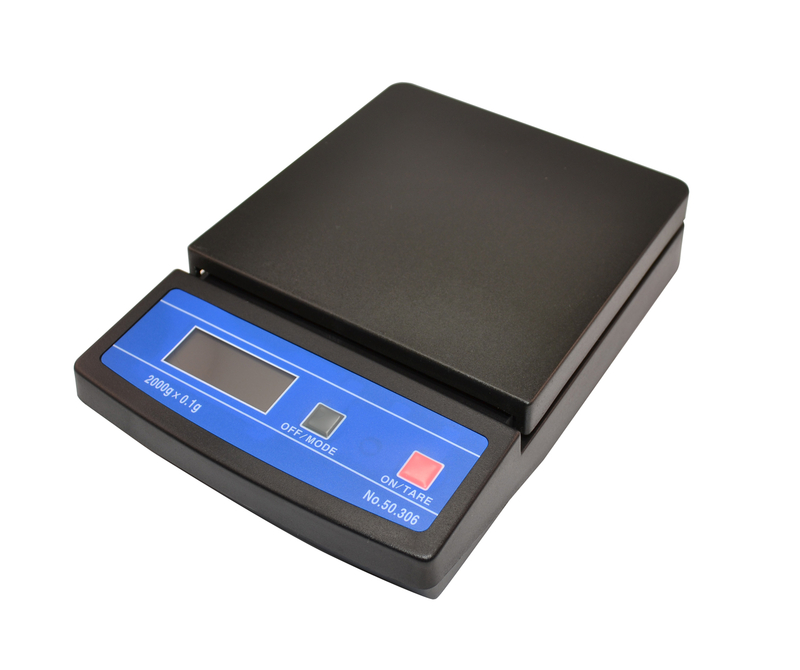 This is a portable carat scale, can work on battery as well as included ac power. Laboratory draft Shield included! 5 year manufacturer warranty-- 7 day TCS return policy. brand New 9th edition! Winter, 2015! Containing watchbands for Jewelers & Watchmakers (WBHQ), Hardware, Variety & Drug Store (Watchbands 2 GO), Medical Alert Products, & more! Please note: this catalog does not contain prices-- ask for our price sheets. Please note that the version on the website, VOL. # 6, is still fairly up to date-- some styles have been added, some have been dropped. Please continue to view that for reference. (Just not for exact prices). PA440 Jewelers Roll of Giftwrap-- Paper/Holographic!--Sandor-- Closeout! New item from a new vendor! We are proud to add JDS/Best Built as a new vendor. JDS brings over 30 years of industry experience to the table! They also manufacture Dust Collectors, Ultrasonic machines, Engravers, and more! Items are Korean made. Great features & quality mean great value! December, 2017: This is now a special order item-- please allow 5-7 days to come in! TW427 Brass Tweezer Set of 5 New from Newall! Set of 5 popular pattern Brass tweezers in handy storage pouch! Like quality products? here is something new! Set of 9 chromed brass screwdrivers from Switzerland! you will see these on the web for as much as $209.95! Screwdrivers made in France. Special order-- please allow 3-4 weeks to come in from Switzerland. 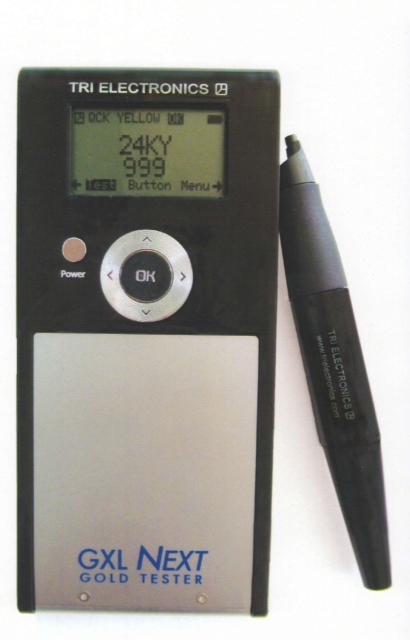 TS-2003 (TS-AGT-1) AuRACLE Gold & Platinum Tester PLUS! KIT-NEW! 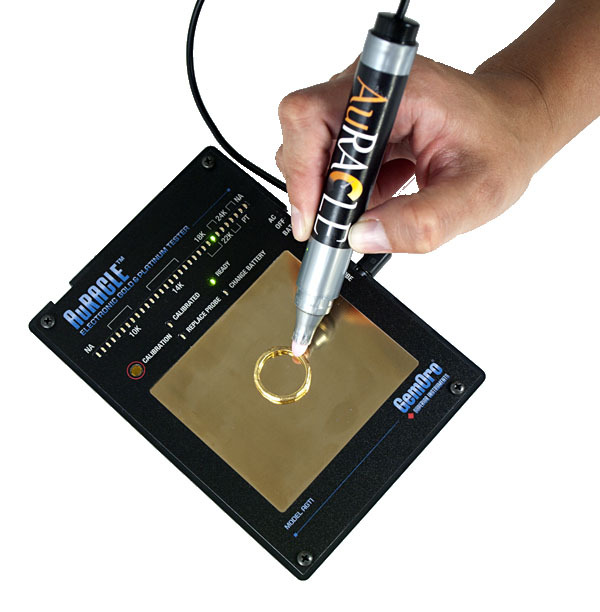 Hottest new item on the market for testing gold & Platinum! Its really that easy to use! Must read and understand all directions and calibrate unit. Please note: Due to incredible demand, we recommend you order now!. 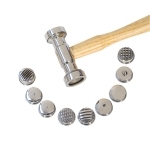 Popular assortment of stainless steel cotter pins for everyday use in watch band adjusting. .90mm diameter. Refills available, just not thru the website, please call in! (Please note: CP1028 and CP205 assortments share the same refills). features 48 popular stems for Seiko, Citizen/Miyota, ETA, Ronda, & ISA. This is a great value! Purchasing these stems individually would easily cost you $150 to over $200.00! Because of the value, this will ship UPS or Fed Ex. Extra shipping charges will apply. HA470.00 New! Texturing Hammer with NINE Different Faces! Textured faces include: Moonscape, checkerboard, diamonds, single square, rain, Mt. Everest, dimple, single round, and wide stripe. will ship ups due to the weight and size. Additional ship charges will apply. CV800 Pocket Watch Display Dome- Oak (Small)- New Vendor! CV800 Pocket watch Display Dome- Oak (Small) New Vendor! Please note, this is the suggested retail/Keystone price. Dealers/retailers looking to purchase at wholesale need to first be registered, and approved for our wholesale section. 4" tall x 3" diameter. New Vendor, unfortunately, prices have gone up. These are getting harder to source. Domes are once again coming boxed, packed well. A finely crafted quality dome is a beautiful way to protect and display antique pocket watches & small heirlooms. Made in the USA! Domes are once again coming boxed, packed well with bubble-wrap. TS56650 GXL Brand! NEXT: GOLD, SILVER, PLATINUM TESTER! Grobet! TS56650 GXL NEXT: New GOLD, SILVER, PLATINUM TESTER! from Grobet! Finally a new tester without complications! Welcome to the next generation of electronic gold testers!! Runs on batteries, the AC adapter is only $20.00 more! 7" tall x 4" diameter. New Vendor! Made in the USA! Domes are once again coming boxed, packed well with bubble-wrap. 351892 Seiko Stem - Tap 11 one of the most popular stems! A large 6" x 3" x 3/8" natural test stone helps you determine the karat value of silver, platinum and gold. Use along with the appropriate test needles and solutions (not included). Comes in a handy premium wood storage box with magnetic closure. Stone is removable to allow use on both sides. Due to the weight, will ship UPS--additional ship charges may apply.